For an ideal browsing experience, please maximize your browser window. More than 20 years ago, Keiser set out to create a bike that would exceed the demands of indoor group cycling. …and we accomplished it all with the simplest of engineering design. Here’s how. Many indoor group cycling bike manufacturers claim a road-bike experience, but don’t get what’s important about road bikes: Frames that vary to accommodate riders of different sizes. We do. Our groundbreaking design mimics different bike frames by enabling the M3i seat and handlebars to be raised in conjunction with one another, fitting longer legs, torsos and arms. The M3i matches riders from 4’10” to 7’ tall (1,1473 mm to 2,233 mm) with a weight capacity of 350 pounds (159 kg), making it ideal for diverse group cycling classes. Other indoor bikes mistakenly place the rider’s sweat zone directly over the flywheel and other vulnerable mechanisms – an obvious engineering flaw. The M3i is more reliable, easier to clean and better protected from sweat and corrosion. Superior sweat protection helps gym owners save money through lower maintenance costs and a longer bike life. It’s easy to “claim” accuracy. Keiser guarantees it. As the FIRST to use magnetic resistance, we revolutionized indoor cycling by delivering a quiet, reliable ride with immediate accurate data for EVERY M3i bike. EVERY COMPONENT of our axle assembly – the core piece responsible for predicting and delivering accurate ride data EVERY TIME – is inspected to meet precise tolerances. And EVERY DAY an M3i production bike is randomly dyno-tested to ensure quality and accuracy. The M3i is the FIRST indoor bike to receive the globally recognized TÜV EN957-10 certification for accuracy and safety. Most competitors’ bikes are not certified by TÜV. The M3i is the FIRST indoor bike designed to predict the power generated at any speed in any gear – ensuring that accurate ride data is always delivered immediately. The competition endorsed Keiser’s engineering by following our lead on using magnetic resistance – but they should have also copied our drive-train design. The simple M3i drive-train – with just a single Poly-V belt – produces the higher speeds necessary for a lighter-weight aluminum flywheel to provide the kinetic energy and magnetic resistance to simulate a good road-bike experience. THEY DESIGNED THEIR BIKE WRONG. Our Poly-V belt design transmits very high loads over very small pulleys, achieving a good road-bike experience without a perimeter-weighted flywheel, a more complicated drive-train and the noise and vibration of a cog belt. The belt’s pre-tension design requires no adjustments, and the drive-train requires no maintenance other than routine inspection. The M3i uses the belt that’s the preferred choice to run the accessories on the front of car engines, because it’s so quiet, durable and reliable. Many manufacturers talk about the distance between their indoor bike’s pedals, and boast about the narrow Q Factor. But their bikes were built around the narrow shoes and pelvises of elite cyclists, even though footwear and people of all sizes can be found in group cycling classes. WHY WOULDN’T YOU DESIGN A BIKE TO FIT EVERYONE? Instead of using straight crank arms to achieve a narrow Q Factor, Keiser recognized the need for versatility. We added curvature to the M3i crank arms to maintain the proper distance for wider hips and any type of footwear, from narrow bike shoes to bulkier gym shoes. Engineered beyond consumer standards for group classes, it’s more than a pedal – it’s a game changer, providing superior comfort, safety and durability. Our M Series pedal ensures that the toe cage remains parallel to the ground and clear of the floor surface. To meet the needs of riders, gym owners and maintenance technicians, we thought of everything when designing the Keiser digital system. The M3i digital display is simple, with everything a rider needs to know on a single screen. Automatically turns on when the room light drops below a set level and remains on, unlike other bikes. Eliminating inconvenience and a cause of wear and maintenance. The FIRST bike to offer Bluetooth® with open API, the M3i communicates with class projection systems while simultaneously syncing data to cycling apps. Our M Series App easily logs every detail of your ride so you can see your progress. Our M Series Instructor App shows live data from multiple bikes allowing instructors to make real-time class adjustments. Use Distance, Energy and Cadence for performance monitoring, and the app doesn’t lock you into any one type of class. Other group class apps simply don’t offer such a wide variety of training options. The M3i features a wide array of details, benefits and features, offering additional fit and comfort, enhanced durability and simplified upkeep. M3i drive-train can be accessed by removing just eight Phillips head screws vs. over three times more on some competitors’ bikes. For holding cell phones and tablets. Mounted directly to handlebars for ease of use and increased safety, especially when riding out of the saddle. Interval training is activated by simply pushing the shifter all the way down and back up, making it ideal for HIIT workouts. Incorporated into frame design and fits both small and large sizes. Continuous design of handlebars provides multiple hand positions for indoor cycling. Quick, intuitive vertical and horizontal adjustments of seat and handlebars, as well as robust knobs requiring less maintenance than a traditional cam-lock. Located on bike base to facilitate pre- and post-ride stretching. The leveler foot can be adjusted by slightly lifting the appropriate corner of the bike and screwing the foot clockwise or counter-clockwise. Fewer parts and a lighter flywheel for ease of transport. With more than a quarter million of our M Series sold worldwide and countless reviews placing in at the top of the industry, it’s easy to see why there is no indoor group cycling bike on the planet more proven than the M3i. The Ferrari of spin cycles. A beast when it comes to spin bikes. M3i is worth the cost. Optimize your ride at home or health club. You choose an app. Keiser gets you connected. Enhance your workouts with endless app possibilities for the ultimate cycling experience. As the industry’s FIRST company-designed projection system, Keiser eliminates any need for gym owners to work with separate bike and projection suppliers. But in true Keiser fashion, the M3i receiver is also compatible with all major projection system providers, giving gym owners a wide array of options. In person – and online – Keiser’s world-renowned Master Trainers offer the lessons, skills and tools so instructors can train clients the right way and keep them coming back for more. 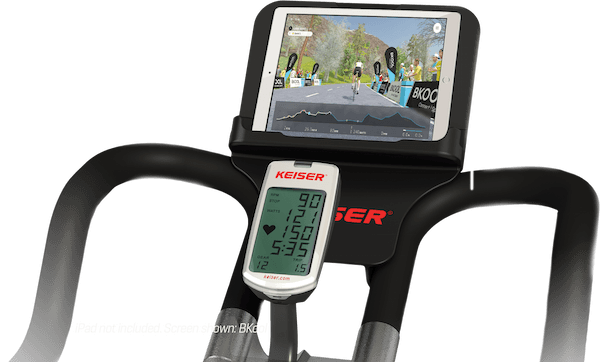 Foundations in an on-site, eight-hour course during which a Keiser Master Trainer teaches and applies all of the required information attendees need to become a Keiser indoor group cycling class instructor. 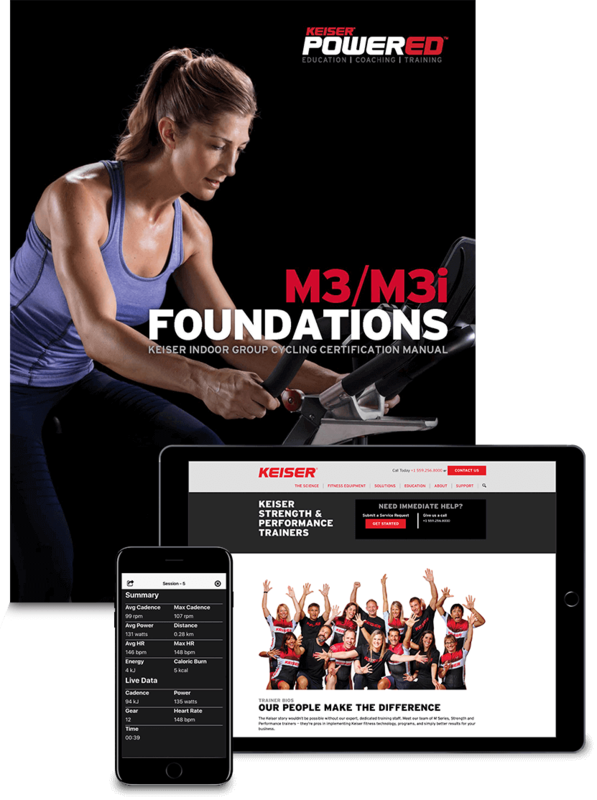 View live data from multiple bikes on one device and make class adjustments in real time with the free M Series Instructor App for Apple® or Android™ devices. …and we accomplished it all with the simplest of engineering design. The M3i is the FIRST indoor bike to receive the globally recognized TÜV EN957-10 Certification for accuracy and safety. Most competitors’ bikes are not certified by T&‌Uuml;V.
Keiser’s commitment to constant innovation continues to lead the indoor cycling industry. With more than a quarter million of our M Series sold worldwide and countless reviews placing it at the top of the industry, it’s easy to see why there is no indoor group cycling bike on the planet more proven than the M3i — and the only bike built entirely around YOU. 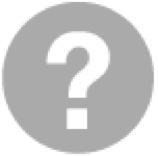 What kind of institution do you represent? Force Machine a.k.a. "Keiser Sled"
Request a visit from a Keiser Demo Van and your Keiser Sales Rep can have you and your team try out as many as seven Keiser machines, including Strength, Functional and Cardio. Currently available only in the US for Commercial Inquiries. Introduce precision to your strength training. Featuring Keiser Air Pneumatic Resistance Technology, our strength machines deliver smooth, optimal resistance throughout the range of motion at any speed, enabling everyone from new gym members to pro athletes to train with greater safety, effectiveness and efficiency. Featuring air pneumatic resistance strength columns that can be attached to a bar, Keiser Racks deliver a smooth resistance that can be used alone or in conjunction with free weights, allowing for a wide array of strength exercises. With a footprint of only 24 square feet (2.2 meters), the Keiser Stretch Corner is capable of accommodating a wide array of stretches while occupying minimal floor space, allowing you to regain square footage inside your facility. 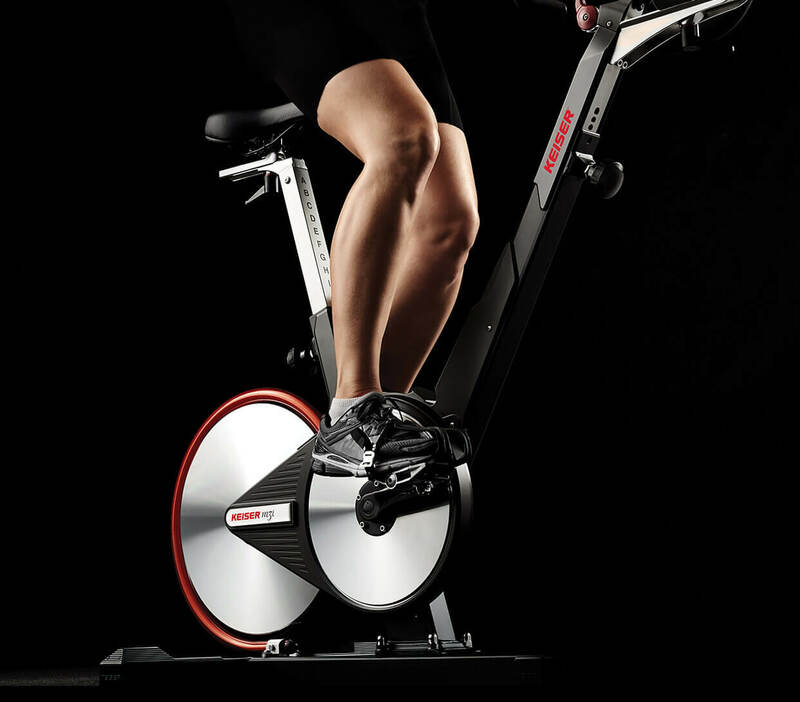 Featuring magnetic-resistance technology, our groundbreaking M Series Indoor Bikes, M5i Strider Ellipticals and M3i Total Body Trainers feature Bluetooth® technology and continue to lead innovation among the cardio equipment industry. Train at the speed of the game or life with Keiser Functional Training equipment. Featuring Keiser Air Pneumatic Resistance Technology, our versatile functional training machines aren’t slowed by gravity and are built for movements at any speed with any resistance at any speed. BASED ON WHAT YOU’VE TOLD US, WE’RE CONFIDENT YOUR MESSAGE WILL GO TO THE CORRECT PARTY. Thank you for sharing the M3i Experience page with a friend.